Active shooter response training for professors and students helps to ensure safety and limit liability at universities across the country. University active shooter events can happen anywhere on campus. Wide-spread aggressive intruder plan is the optimal solution for providing school security and effective preparedness to an entire campus population. Universities and colleges often span large geographic areas, and many have additional locations in other cities, states, or countries. Many operate complex enterprises in addition to their academic programs, including hospitals, research and development facilities, performing arts venues, athletic complexes, agricultural centers, residential complexes, and transportation systems. They frequently have open campuses that are integrated into the surrounding community, with visitors regularly on campus touring facilities, attending events, and receiving medical care. Colleges and universities serve primarily adult students who are capable of making decisions on their own. The campus population is perpetually in flux, changing from day to day, semester to semester, and year to year. Some students commute to and from campus, others attend class virtually, while still others live in housing facilities located on or near the college campus, resulting in a dispersed population. While these characteristics pose challenges, ALICE Training can help universities and colleges take steps in preparing for a university active shooter event. Active shooter training for professors and students will help ensure school security in the event of an active shooter at college classrooms. Whether you’re a small, local college or a university with thousands of student – we’ve got you covered. Interactive training course for students and professors to receive an individual certificate. If classroom lockdown is the only school security plan at your University . . . you’re not taking the proper steps to minimize the threat of a classroom shooting. 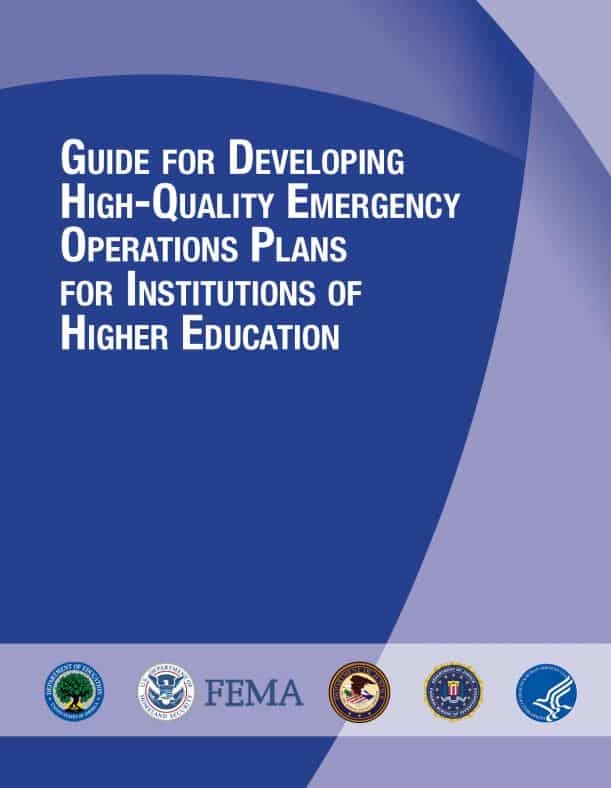 In 2013, the US Department of Education spent considerable resources researching active shooting events at colleges and universities. Their findings have resulted in a change in guidance. 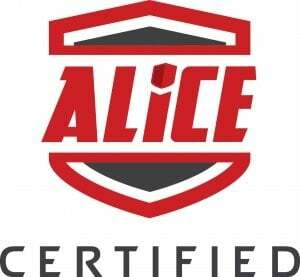 ALICE Training protocols are used almost exclusively in this new, national guidance. Following current federal and safety organizations recommendations is a necessary step in limiting the liability of a university or college. By preparing for an active shooter at university campuses and classrooms, higher education organizations can demonstrate that they have met today’s national standard of care. Certify your University as part of your Aggressive Intruder Plan. 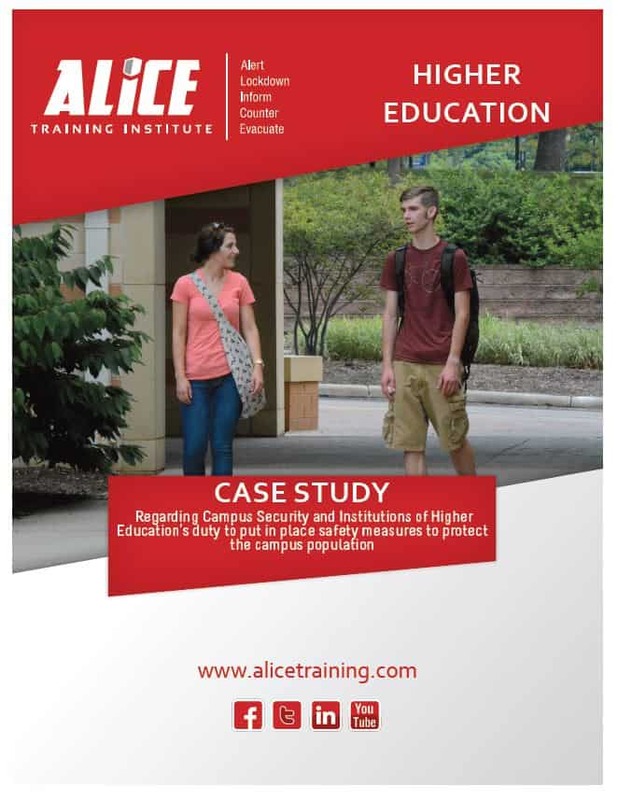 Higher education organizations who understand the importance of ensuring safety in the event of an active shooter at college campuses and classrooms are certifying their facilities through ALICE Training. Lockdown is not enough. Active shooter response training will minimize the loss of life during a classroom shooting and limit a universities’ liability after an active shooter event occurs. Friday, educators, law enforcement, health-care workers, and other safety professionals from our area and beyond came together for an “ALICE training workshop” at the Zanesville Campus of Ohio University and Zane State College. ALICE stands for alert, lockdown, inform, counter, and evacuate. Instructor Tony Castillo says the purpose of the ALICE Training method is to teach a proactive response-approach to violent intruder events. The University of North Alabama is offering free active shooter training for students through the ALICE Training program. The ALICE Training program stands for alert, lockdown, inform, counter, and evacuation [evacuate]. UNA has been offering this course for the last three years. The university feels it is not enough for police to be trained on active shooter situations and wanted to educate students, faculty, and staff on what to do. MacGyver has nothing on Youngstown State University police officer Don Cox. “MacGyver” was a 1980s TV show in which a secret agent solved complex problems by using ordinary objects. Tuesday, while showing university residence-hall workers how to defend themselves against a gunman inside one of the buildings, Cox showed the students how to lock a door – with a belt.